The library is hosted on GitHub and has symbols for 16-segment, 14-segment, and 7-segment LED displays. All visible ASCII characters are covered (32 – 127 inclusive). Both binary and hexadecimal literals are included depending on your application, as well as images of the characters and a display segment legend. 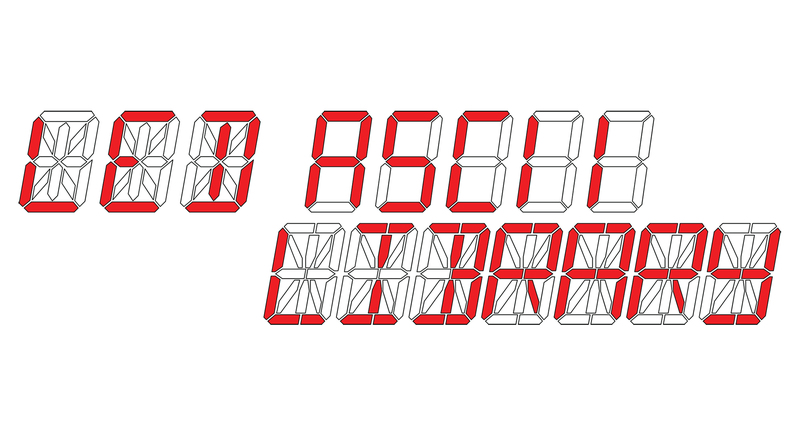 You can find the library here: LED Segment ASCII Library. All of the character patterns and the associated symbol literals are released under the widely permissive MIT license, while the images are released under Creative Commons – Attribution. You can find the full texts of each license in the repository as well. If you find a problem or have a suggestion to improve one of the characters, please create an issue on the GitHub repository. Otherwise, enjoy! Thanks for sharing the library and great job as always! I was looking to model my project after yours and was wondering if you would mind sharing the PCB files on Github also or through e-mail? Thanks. Thanks GK! I’m going to keep the PCB design files for the time circuits close for the time being. I still haven’t decided if I want to make them available. I certainly can can respect that. I know how much time and effort it takes to build this project. Like you, I’m trying to build mine right and I appreciate all the great info so far!